That was my first glimpse of the trains which I consider the best diesel train that the UTA put into service and certainly a candidate for the best diesel trains in Ireland to date. We knew them as “DEs” – the term “Hampshire” was used by some others more attuned to the GB scene, because of course the power arrangements were the same as used on BR’s Southern Region. The power unit was a chunky EE four-cylinder generator driving electric motors on the power car rear bogie. They never reached the very high speeds an MPD on a good day could do, but they were definitely a “proper” modern train with the lighter panelling inside and very comfortable modern seating; the ride wasn’t the best at the back of the power car and the vibration there was high –and remained so to the end of their lives. You can still experience it for a while (slightly muted) on the NIR class 450 DEMUs, which are now the last of their kind in public operation in the UK. In the un-powered “trailers (there was a first / brake, restaurant and two thirds, all compartment stock), the ambience was similar to that of an LMS or BR Mk1 express train. Later the power cars received names of “Rivers” under NIR and they lasted until the mid-eighties when the bodies were scrapped and dumped and the power units taken to Derby for re-use in the Castle / 450 class. I’d built a number of 4mm model MPDs and a three-car MED train previously, and these have been covered in New Irish Lines. But I’d always liked the idea of doing a DE set. The question was how? During research for my book on UTA diesels I came across some articles, photographs and a few drawings (of the power car and 87/550) and from these I decided to build a six car set as two of these sets operated the principal services on the ex NCC main line. The power cars were something of a challenge. They were 63 feet long, with side ventilation grilles in the power compartment. With these, sundry doors and a unique front cab; there was no chance of a simple bodge here. The SR trains, although mechanically similar, looked very different. I had, however an old three-car Lima Class 117 DMU and realised that the under frames of these, suitably hacked by getting rid of most of the engine bits underneath, would do. In the case of the DE trains, the rather large Lima pancake motor isn’t a problem; it’s no bigger than the real engine was! Indeed, in the dummy car I built a plastic card “engine”; I have since acquired a 4mm model of the EE power unit from a firm called Southern Pride, but haven’t got round to fitting it yet. From memory these engines were a greeny/grey shade when new. 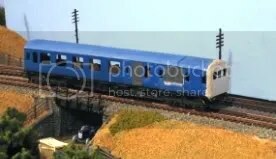 The sides of the two power cars were made from the same source as my MPD/MED models, panels cut from Hornby LMS Stanier coaches and then glued together – “cut and shut”. SE Flushglaze windows improve them no end. Charlie Petty at DC kits provided underfloor etches, roof exhaust panels, and sundry grilles from his SR DEMU kits: beware if fitting the grilles, make sure you use butanone glue as the normal plastic weld glues won’t hold them. 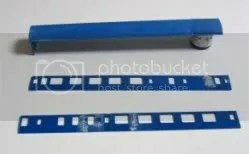 In fact, I had a problem too with the Lima bogies when I tried fitting a plastic card yaw damper/shock absorber (or whatever it was) that is prominent in photos of the EE bogies. I couldn’t get them stuck as the Lima plastic is slightly flexible. In the end I got a useful tip which was to use a combination of MekPak and Evostik. This worked well. The bogies were not a BR design and I have not seen anything like them on any other model to date. I lowered the bodies on the under frame as they seemed to sit too high: this is an awkward job on the power bogie and quite easy to make a mess of. A better, though more expensive way of doing the under frames might be to take a Mk1 coach under frame and fit a Black Beetle power bogie. Then I had to build those cab fronts. I used sheet plasticard and cut the windows out, then glued them to the sides and made the rounded edges with filler. The headlamp housing was made from part of a plastic tube filled and sanded down to shape, quite a fiddly job. But once painted the whole thing looks rather well. The train is a little narrower than scale, I think, judging by end on photos, but I can live with that, as it runs on 16.5mm track anyway! Painting the fronts was also quite tricky, I cut curves into masking tape (I prefer the Tamiya product) to reproduce the swooping lines of the livery. Arguments rage about what colour was used precisely: I just used BR “blood” and white. The crest that adorned the front of these trains for the first year or so of their lives, I’d love to have, but can’t figure out a way of doing it – yet. Anyway, some of them ran briefly without any insignia on the front before the NIR one came into regular use. After all that the trailers were relatively easy. I’d originally thought I would simply respray two Hornby brake ends and two composites, but when I started looking at the trailer coaches in a bit more depth (there’s an excellent photo of one of these in Des Coakham’s book on Irish broad gauge coaches) I realized, that, not for the first time, the UTA ones were quite different in some respects. The first/brake (701) had only four compartments and being first class they were of course considerably wider than second class. I modelled mine by cutting panels out of the Hornby composite and the brake end to get close to the correct layout. The all second class ones had both lavatories at one end, similar to the slightly earlier Cravens coaches on CIE, rather than one each end, as BR and the LMS had arranged them. So I had to do some switching of a few “panels” around to get them near correct also. The good news is that they are correct length – viz. 57’. For that reason I modelled the rebuilt restaurant car 548; this had been a 1924 built NCC coach and worked with the MPDs in original form. The first six car set got 550 (ex-87), a 60’ coach, when the second DE set entered traffic there was need for a second restaurant car. The North Atlantic diner had worked with the MPDs, but was not fitted or refurbished for use with DEs, presumably because with its totally different window pattern, a complete rebuild would have been needed and it was just deemed not worth it. So 548 was re-skinned and given a look that matched the other coaches quite closely. So that is it, for now. I still have to apply numbers and someday will get round to it. This train, like its prototype, has been quite a favourite with the public when it has been shown on our UTA era layout “Killagan”. Someday I may re-engine it with a smoother newer power unit, and I would quite like to fit sound modules when someone does one with that wonderful distinctive throbbing beat I remember so well. Which might mean looking at DCC…but that will be another story. I am building a new layout partly based on Coleraine in the 1960’s, so I’ll be able to re-create the moment I referred to at the start of this article, in my own home, one of the great delights of this hobby of ours. 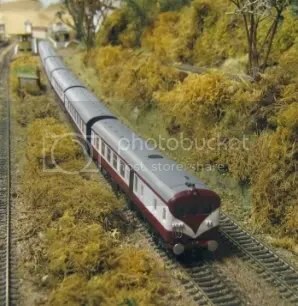 Very nice model of the now-vanished 70 class DEMU you have made there.l rode on one in the early 80s on a look around the NIR system,and was struck by how they sounded like the old Hastings DEMUs l worked on! l’ve never seen the bogies under the 70 class power cars on anything else either.lt seemed to be a cross between a B5 and a later B6 type.We had B6s on our VEPs,later CIGs,REPS and EDs.